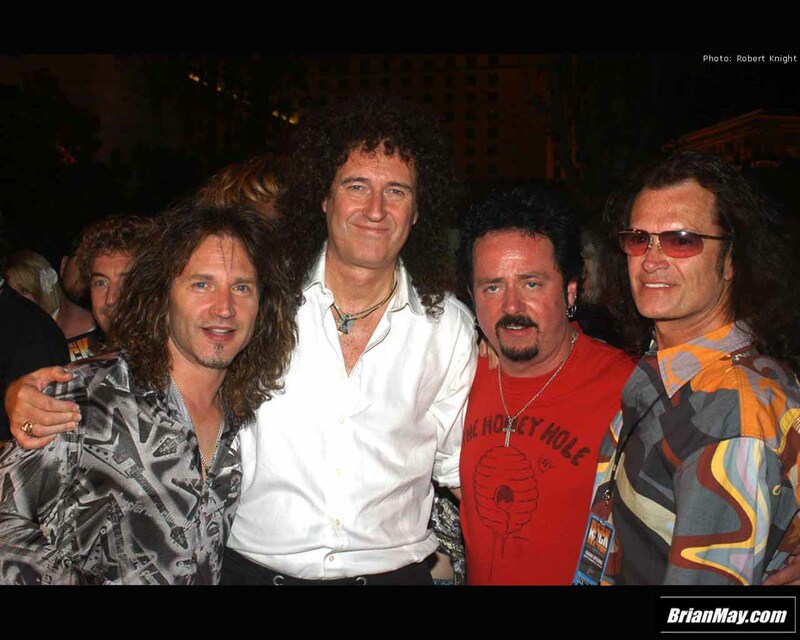 On Wednesday, September 8th, 2004 - GLENN performed at an "After Party" to celebrate the USA debut of We Will Rock You that is now playing at Paris Las Vegas. He was personally invited by Brian May and Roger Taylor and also celebrated the event with many of his closest friends including Chad Smith, Steve Lukather, Steve Vai, Simon Phillips and Eric Singer, just to mention a few! It was a great show. A full setlist will follow a little later. Others in attendence included Robert De Niro (yes, the actor, but also one of the show's producers), Kevin DuBrow and Meatloaf! Aside from this interview....also in attendence was Bob Coburn of Rockline and both GLENN and Steve Lukather will be featured on an upcoming broadcast, taped at the After Party - most likely to air next Wednesday (5th) and Saturday (8th) - check their website for confirmation. Here is the setlist and a couple more pix. Also in attendence and playing at the show was Nuno Bettencourt (Extreme) and John Miceli (Meatloaf). Fantastic ! Great job ! A great reunion. I`m wait to see this in DVD someday. You can also find some further info & links to more pix of the event by visiting Brian May's website. Thanks for sharing those Gabi, David. The photos give you a real feel of the event. Everyone wants a piece of Glenn nowadays - I'm so proud to be associated with such a wonderful musician and brother. So many exciting times ahead - for him and for us! Great, what a "package". Would love to hear that. Does anybody have an idea if it was recorded. I wish it was. It would be a pity if they didn't either film it, or at least recorded the music. Wow, Glenn Hughes and Roger Taylor in the same place at the same time playing quality songs. It doesn't get much better than that. Also of note along the "We Will Rock You" show is that Danny Miranda has left Blue Oyster Cult to play Bass in the show. Dan Miceli will be joining on the drums also. Clip No.3 is probably the more interesting of the bunch...is that GLENN I hear briefly in the background during the early part of the clip? You 'gotta listen closely! Amongst others, GLENN gets a mention at the end of this article in yesterday's The Seattle Times.